The essential dramatic persona of my Nonet for wind quintet and string quartet is symphonic in its aural scope, sonic architecture, musical expression and virtuosity. In the 90’s I had composed a concerto for the Quintet of the Americas which was premiered at Carnegie Hall and subsequently recorded on MMC Recordings. I therefore have had, for a long time, a strong image of the Quintet’s musical personality although the Nonet is our first collaboration and major experience together since the earlier premier and now with another ensemble, The Quartetto Latino Americana, added to the mix (the Q.L.A. has been planning for a while to perform my 8th String Quartet and it seems a certain ‘karma’ has brought us all together since the they are currently in residence at my first Alma Mater, Carnegie Mellon). One of the most highly regarded and well-known composers of his generation, William Thomas McKinley (b.1938) learned both classical and jazz piano at a very early age, becoming the youngest member of the American Federation of Musicians at just twelve years old. To date, he has composed over 300 works, is listed in Groves' Dictionary of Music and Musicians, and has received commissions from the Lincoln Center Chamber Music Society, the Fromm Foundation, and the Naumburg Foundation. His many awards and grants include, among others, an award and citation from the American Academy and Institute of Arts and Letters, a Guggenheim Fellowship, eight NEA grants, and a Pulitzer Prize nomination. McKinley has studied with many renowned teachers and composers, including Aaron Copland, Lukas Foss, and Gunther Schuller, and as a jazz pianist has performed, composed, and recorded with Dexter Gordon, Stan Getz, Eddie Gomez, Gary Burton, Miroslav Vitous, Rufus Reed, Roy Haynes, and Billy Hart, to name a few. In 1992, McKinley founded MMC Recordings with the goal of connecting composers with the finest orchestras, conductors, and performers in the world, releasing their recordings, and creating an archive of modern classical music. The label’s primary collaborators include luminaries such as clarinetist Richard Stoltzman (a long-time friend and supporter of McKinley and his music), conductors Gerard Schwarz, Marin Alsop, Carl St. Claire, George Manahan, Kirk Trevor, Gil Rose, as well as the London Symphony Orchestra, Seattle Symphony, Warsaw Philharmonic, Boston Modern Orchestra, and many more. 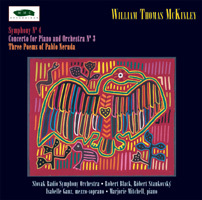 In recent years, McKinley has become even more prolific, and his works are featured on releases from Koch, Delos, and RCA Red Seal in addition to those on MMC. 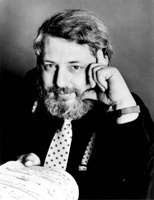 World premieres of his 7th Symphony with the Seattle Symphony and R.A.P. (Rhythm and Pulse), a double concerto for Richard Stoltzman (clarinet) and his son Peter (piano), with the Boston Modern Orchestra, and the Nonet for the Quintet of the Americas at Carnegie Hall are all scheduled for 2006-2007. There is music in poetry, and poetry in music. Through McKinley’s perfect union of word and melody, he demonstrates how the two arts are inextricably bound. Thus, any questions about hegemony of one over the other do not exist here. The work, titled Three Poems of Pablo Neruda, is scored for mezzo-soprano and full orchestra. In its role of accompanying the singer, the instrumental parts are so unobtrusive as to go almost unnoticed, as in the opening of the first song, “Black Vulture” (tenebre e tragico). At other times, the orchestra borrows thematic material from the solo line, intensifying its expressive impact. Still other orchestral passages are onomatopoeic in their tonal portrayal, as in the prestissimo e barbaroso introduction to the second song, “The Chilean Tinomou” (a bird indigenous to Central and South America). McKinley’s Concerto for Piano and Orchestra No. 3 is a jazz piece of four movements which segue without pause. It is a mono-thematic work, at least by virtue of the idiomatic “blue-note” ingredient characteristic of jazz music, and omnipresent in this work. Nevertheless, the quasi-cyclic movements are individually distinguishable by McKinley’s rhythmic treatment of his melodic and harmonic materials. Jazz artistry presumes the ability of the musician to improvise. It is composition extempore, and McKinley’s prowess in this area is formidable. The same Muses who channel their inspiration through his fingers to the piano keys are at work here as well; creativity is merely redirected through his pen, encoding the music, fortunately allowing for its re-creation. Symphony No. 4 is a three-movement work for full orchestra (minus trombones). The score calls for a battery of pitched and untuned percussion instruments subtly exploited in the generation of rhythmic color which contributes to the propelling force felt from the opening notes to the very end of the piece. In addition, McKinley’s intimate understanding of the capabilities of all the instruments enables him to synthesize their individual sounds into a single unique voice capable of a seemingly infinite range of expression. He thus has the means with which to evoke the imaginations of his listeners, as he does by titling the movements respectively, “Dawn Blues,” “Sunrays,” and “Night Fancies.” Whether the titles served to inspire the composition or whether they were decided by the composer as an afterthought is not totally irrelevant. The more romantically inclined may enjoy the piece as a musical description of a 24-hour slice of life.